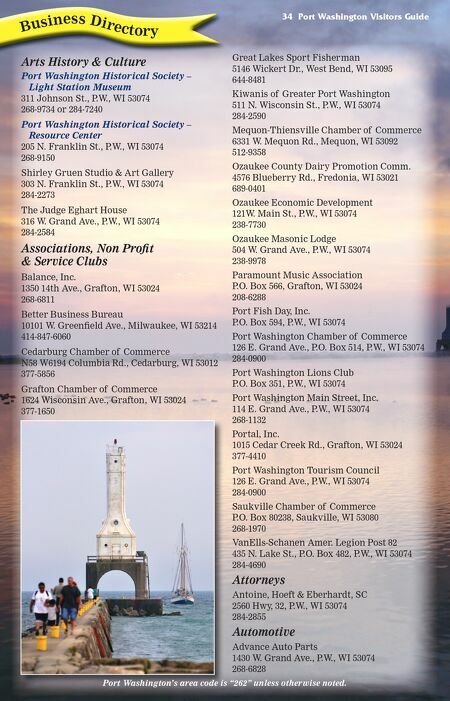 Port Washington Visitors Guide 35 Bu s i n e s s D ir e ct o ry Becks Grand Ave. Mini Mart 223 W. Grand Ave., P.W., WI 53074 268-8370 Schmit Bros Auto, Inc. 925 E. Green Bay Rd., P.W., WI 53074 284-8844 Building Services and Home Improvement Bielinski Homes 1830 Meadow Lane, Suite A., Pewaukee, WI 53072 542-9494 Franklin Energy 102 N. Franklin St., P.W., WI 53074 284-3838 Child Care/Pre-School Community Learning Center 1234 W. Lincoln, P.W., WI 53074 284-6502 Chocolate/ Ice Cream Chocolate Chisel 125 W. Grand Ave., P.W., WI 53074 261-0200 Coffee House Chocolate Chisel 125 W. Grand Ave., P.W., WI 53074 261-0200 Java Dock Cafe 116 W. Grand Ave. 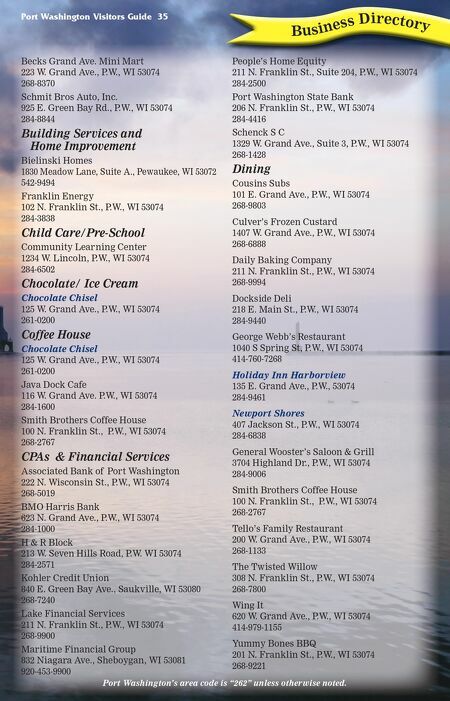 P.W., WI 53074 284-1600 Smith Brothers Coffee House 100 N. Franklin St., P.W., WI 53074 268-2767 CPAs & Financial Services Associated Bank of Port Washington 222 N. Wisconsin St., P.W., WI 53074 268-5019 BMO Harris Bank 623 N. Grand Ave., P.W., WI 53074 284-1000 H & R Block 213 W. Seven Hills Road, P.W. WI 53074 284-2571 Kohler Credit Union 840 E. Green Bay Ave., Saukville, WI 53080 268-7240 Lake Financial Services 211 N. Franklin St., P.W., WI 53074 268-9900 Maritime Financial Group 832 Niagara Ave., Sheboygan, WI 53081 920-453-9900 People's Home Equity 211 N. Franklin St., Suite 204, P.W., WI 53074 284-2500 Port Washington State Bank 206 N. Franklin St., P.W., WI 53074 284-4416 Schenck S C 1329 W. Grand Ave., Suite 3, P.W., WI 53074 268-1428 Dining Cousins Subs 101 E. Grand Ave., P.W., WI 53074 268-9803 Culver's Frozen Custard 1407 W. Grand Ave., P.W., WI 53074 268-6888 Daily Baking Company 211 N. Franklin St., P.W., WI 53074 268-9994 Dockside Deli 218 E. Main St., P.W., WI 53074 284-9440 George Webb's Restaurant 1040 S Spring St, P.W., WI 53074 414-760-7268 Holiday Inn Harborview 135 E. Grand Ave., P.W., 53074 284-9461 Newport Shores 407 Jackson St., P.W., WI 53074 284-6838 General Wooster's Saloon & Grill 3704 Highland Dr., P.W., WI 53074 284-9006 Smith Brothers Coffee House 100 N. Franklin St., P.W., WI 53074 268-2767 Tello's Family Restaurant 200 W. Grand Ave., P.W., WI 53074 268-1133 The Twisted Willow 308 N. Franklin St., P.W., WI 53074 268-7800 Wing It 620 W. Grand Ave., P.W., WI 53074 414-979-1155 Yummy Bones BBQ 201 N. Franklin St., P.W., WI 53074 268-9221 Port Washington's area code is "262" unless otherwise noted.